Sophia E. Lee ‘12 and Brian L. Ross ‘11, dressed up as a latke and a hamentash, engage in a fierce but playful battle before the start of the eighth annual Latke vs. Hamentashen debate held on Wednesday evening in 26-100. Latkes or Hamentashen? That was the question this past Wednesday as students, faculty, and staff packed into 26-100 in anticipation of MIT Hillel’s annual Latkes vs. Hamentashen debate. Six professors fought it out, arguing for the ultimate Jewish food product: the latke (a fried potato pancake eaten during Hanukkah) or the hamentash (a three-sided filled cookie eaten during Purim). In a public statement posted Wednesday on his website, Chancellor Phillip L. Clay PhD ’88 responded to the Institute-wide Task Force recommendations. While some of the cost-cutting ideas will be implemented soon, many major ideas — like adding more undergraduates, opening summer classes to a wider demographic, eliminating Athena clusters, changing add drop date and modifying the existing dining system — will require further research before being implemented. Two video cameras monitoring Lobby 10 were removed yesterday morning, according to Thomas W. Komola of the Security and Emergency Management Office. MIT plans to close most dorms to undergraduates over the summer, according to Dormitory Council President Abdulaziz M. Albahar ’10. 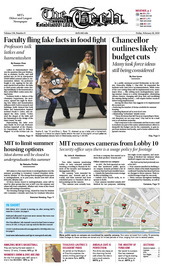 The change from keeping all dorms open to undergraduates, as in past years, should save MIT about $500,000, Albahar said.